Items can be acquired by farming, looting, upgrading their own item. If you do not agree do not send donation as your way to start bullying our GM or Admin. 1. 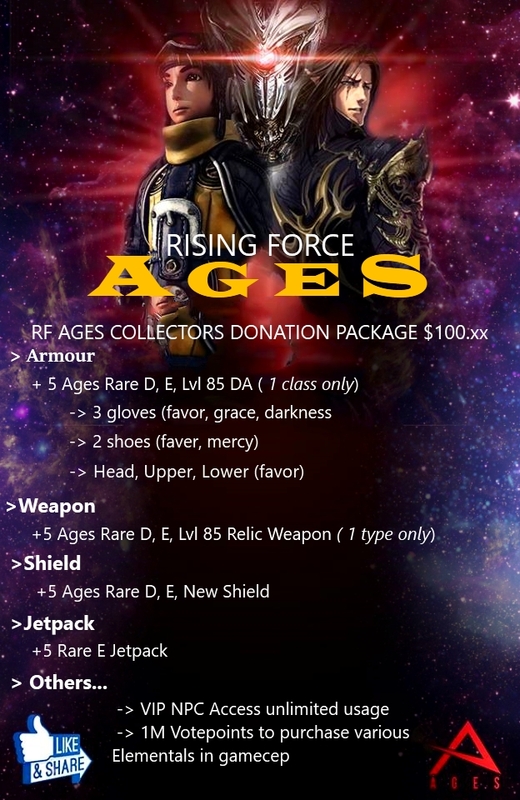 You agree not to recall your donation to RF-Ages or to any of its affiliates. 2. You agree that this donation is voluntarily and NON REFUNDABLE or disputable for any reason whatsoever. 3. Any attempt to fraud donations will be immediately subject for account removal. 4. You bear to full responsibility of the rewards given in accordance to your donation. No admin intervention will happen in the even your rewards was lost/stolen/accidentally sold to npc or dropped in game. 5. If you dot agree to clause and terms stated here, do not send any donation. Will be processed with in 24 Hr after confirmation of your donation. Ask how many racemoney and gold in your inventory or votepoints or cashshop points to confirm your are not being scammed.